Good nutrition goes a long way toward creating balance in one’s life! If your habits for nourishing yourself are not chosen with sufficient consciousness and awareness, you, more often than not, make choices that are not in your best interest. Good food choices support good health. For the past few weeks, I have been collaborating with the Power Women of NSA to achieve optimum health through food. Think about it – as a society, we tend to choose poorly, relying on fast food, convenience foods and more! While the motto “moderation in all things,” is a simple and helpful guideline to create health, it needs to be interwoven with the motto, “energy flows where attention goes.” Balance alone will not give us optimal health, for there is a continuum of health practices and choices that you can and should make. Moving along the continuum of optimal health requires increasing consciousness and awareness about lifestyle choices. How do we make healthy choices? How do we correlate the season with food choices that are easy on the wallet and on our health? Eating in season is not only possible…but healthy too. And let’s talk about our trip to the supermarket, convenience foods, cost, crops, taste, variety, and home grown – and getting through the summer without ruining our health! Take a mental walk through your supermarket. Have you noticed how little fresh produce there is? Exclude the frozen and canned foods, and except for the dried beans and rice, you might be surprised to realize that none of the products in the main body of the store are fresh. They are all processed. Does it smell like food? How much of the products stocking the shelves are organic? We have heard of the problems with growth hormones. How much milk is there that is free of this? So much of what is considered “food,” is so deplete of nutrition and so full of chemicals that consuming it is hugely implicated in the rise in obesity/diabetes, cancers, Fibromyalgia and more. Go through your pantries and refrigerator at home. How much of the food there is real and unprocessed? We hear all the time about how processed foods are not good for us nutritionally, but it takes more than just hearing that to realize the truth of it. And how often do you stop to examine your assumptions about the foods you are buying? I have been reading labels for years and years, and though reading labels definitely helped me buy healthier foods, it did not help me realize how dependent I had become on convenience foods. Most all of us have been raised in the world of convenience foods. It has become our paradigm to rely on convenient, processed, prepared food. The generations in their 40s and beyond will not have had as much processed foods when children, nor as much sugar intake as those younger. Those younger generations have no real experience of what it was like to live in a world where people ate whole foods. Hectic work schedules lead to overuse of convenience and fast food. Do you eat and drive, talk on the phone, eat at the workstation? To this add that about 40% of all our meals are regularly eaten at restaurants or fast food chains, and very few of the countless options for us to choose from are organic, vegetarian, or serve beef and lamb that are grass fed. 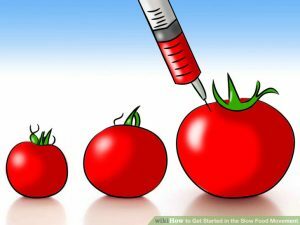 If the food is not organic then it is genetically modified. What we are doing to ourselves with all of this we hardly know. Can you remember when the family meal was a time when all family members were together engaging in a ritual that brought cohesion, relaxation, good conversation and laughter — great elements for proper digestion. Can you bring back the smells of the home cooked foods, memories of special tablecloths and dishes, the fun of candlelight dinner? Perhaps you had the bounty of coming from a family where everyone pitched to help with the preparation and clean up, so that when the meal was over, everyone could sit down and relax for the rest of the evening. Let’s face it … we are all overextended, and Americans do tend to eat out fairly often. We might select foods that are easiest to get into our mouths quickly and on the go. The easiest foods are too often the worst for us: highly refined, processed, and packaged foods. Most restaurants will cater to special dietary requests. Never hesitate to ask for healthful choices. For example, most pasta dishes can be made with whole grain pasta in lieu of white flour; ask, and be pleasantly surprised. Shop the perimeter of the grocery store, where fresh foods like fruits, vegetables, dairy, meat, and fish are usually located. Avoid the center aisles where junk foods lurk. Choose “real” foods with as little processing and as few additives as possible. Remember, if you want more salt or sugar, you can always add it yourself. Avoid foods that contain more than five ingredients, artificial ingredients, or ingredients you can’t pronounce. Produce is in season – it makes perfect sense to buy fresh! Where do you go to find simply healthy foods? 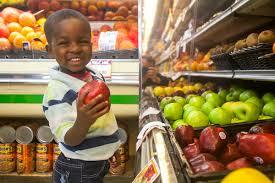 My favorite places to shop are fresh markets with great selections. 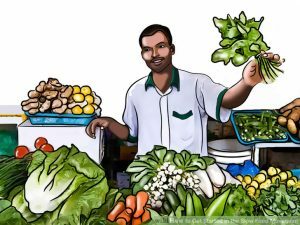 You walk in and smell the aroma of fresh vegetables and fruit; your eyes are flooded with the beautiful array of colors of fresh vegetables and fruits that fill the space. Produce is readily available and the cost of seasonable products creates real savings to one’s wallet. Even with the weather challenges we have faced, the crops look good, and taste even better. Taste can be as important as cost. Think about it. Would you rather eat a dark red, vine-ripened tomato still warm from the summer sun or a winter hothouse tomato that is barely red and lacking in flavor? Fresh, locally harvested foods have their full, whole flavors intact – and you can taste the difference. Explore what is harvested locally in your own area by visiting www.localharvest.org and identify farmers’ markets near you. You will also discover seasonal produce guides. Although it is virtually impossible to eat locally and in season 100% of the time, we can make a good effort. If possible, grow it and pick it yourself. If gardening is not for you, visit a local farmer’s market weekly or join a Community Supported Agriculture (CSA) farm to acquire fresh products at local distribution locations. Determine what is in season now, and get started on the road to fresh! Why worry – read on! Organic is a way of growing crops in greater harmony with nature, without using synthetic pesticides, fertilizers, antibiotics or growth hormones. Certified Organic products must be grown and processed according to the USDA Organic Standards with inspections to verify organic authenticity. Regulated by strict standards and yearly inspections. Processed without synthetic colors, flavors, preservatives and other common additives. In greater harmony with nature using methods to protect soil, water and air quality. Safer for farmers to grow. More nutritious than other foods. Freshness and level of refining have greater impact on nutrients. Pesticide-free. Some chemicals persist in the soil for years; others come from nearby farms or water supplies. To reduce chemicals in your food. To avoid genetically engineered food. To avoid food processed with irradiation. To avoid use of antibiotics and synthetic growth hormones in animals. Highest in pesticide residue: peaches, strawberries, apples, cherries, sweet bell peppers, lettuce, celery, pears, nectarines, spinach, grapes (imported). So, go ahead and eat to live … making wise choices and maintaining your health!